Have you got a baby that hates sleep? Or at least hates to let you sleep for consecutive hours at night? There is one thing that you can do to gently encourage your breastfed baby to sleep for longer stretches at night, without crying it out. Read on to find out this simple trick that will help you and your baby sleep longer at night. I have breastfed all four of my children. In fact, I am still feeding my now 20-month-old youngest daughter, Zara. My experiences with each of them were different with various levels or ease or difficulties. My 2 boys, they were not “good” sleepers as babies. Dylan, my eldest, did not sleep through the night even once until he was nearly 2. I thought that was what all babies did. I accepted it. As he was my first baby, I merely followed his schedule. He keeps me up feeding through the night and I caught up when he napped through the day. As he was my first child and was under no pressure to return to work quickly, I had that luxury. When I had my second son, I had no such luxury. He too kept me up feeding through the night, but I still had to adhere to the daily parenting routine that went with having an older child. Whether my baby boy had slept at night or not, even if he finally wanted to sleep when it was time for me to get up, I still had to get up and deal with breakfast, the school run and the rest of the day with my older son. So I did what I always do when I run into a parenting problem, I went into crazy research mode and read everything I could get my hands on with regards to the subject. I came across lots of advice & interesting points, but one thing in particular stood out, it was something of a light bulb moment. It was the most common sense that I had ever come across, I was amazed that I had not thought of it myself. I was eager to try putting this new theory into action immediately. 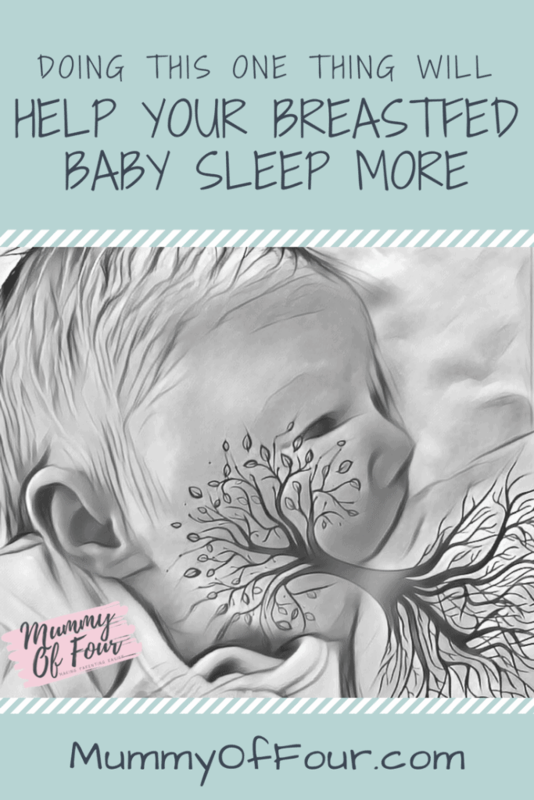 As soon as I did, I was pleased and delighted to find that my restless baby boy slept for longer and longer between feeds. It was a miracle! Yet so simple. If for dinner, you only to eat one or two spoonfuls of food, you would be hungry again very soon. You would no longer be starving, but you would not be anywhere near full enough to be satisfied for very long before you wanted more food. The same principle applies with babies. It is obvious and makes perfect sense. Yet, when I had my sons, I would feed them when they woke at night for a few minutes, then, the moment they drifted off, I would eagerly place them in their cots and immediately go back to sleep myself. Every time, without fail, they would wake, only a handful of minutes later, and I would wake back up, groggy having just drifted off, and almost in tears begin to feed them again. Next time you are feeding your baby, remember that if they fall asleep while feeding it is not necessarily because they are full. Small babies get tired before they get full. If you put them down the second that they doze off after feeding for only a few minutes, I guarantee that they will be waking you for a second helping very soon. When your baby wakes at night, look at the clock. Start a timer if you like. I discovered this great app that helped me time my feeds, plus how much the baby sleeps. It is great to see the correlation between longer feed and longer periods of sleep. Alternatively, you can download my printable breastfeeding log. Next accept that you will be awake for some time during the feed. I suggest turning on a dim light, wiping your face with a damp cloth, have a big drink an queue up an episode of something that you are really into. I found NOW TV was my best friend. Feed your baby. When they begin to drink off, use breast compressions to encourage the flow of milk and remind your baby to feed. When they drift off entirely and cannot be woken by breast compressions, if they have not yet been actively suckling for 20 minutes, remember that they are still not finished. Change their nappy, take off a layer of their clothing, put back on a layer of clothing, give them a gentle wipe with a damp cloth. Do whatever you must to wake them enough to finish their feed. Once they have finished their minimum of 20 minutes active feeding, more if they wish, you can place them back in their cot, safe in the knowledge that they have a full tummy and a dry bottom, and you have the best opportunity to get some rest for a few consecutive hours. In doing this, not only will you be ensuring that they are full enough to sleep for a much longer stretch before becoming hungry again, you will also ensure that they will feed past the thirst quenching “fore milk” to the calorific and more nourishing “hind milk”. Encouraging your baby to feed in this fashion will aid their weight gain far better than feeding for the same total number of minutes but spread more randomly through the day. So give it a go. Tempting as it is to close your eyes as soon as your baby closes theirs, this method will see to it that the sleep that your baby sleeps in longer blocks so that you can too. NOTE : Newborn babies or babies of a low weight will need to be woken to be fed at least 4 hourly to be fed, counting from the beginning of the feed. Speak to your health visitor if you are concerned. How do you handle night feeds? Do you go straight back to sleep as soon as your baby does? Or encourage them to get a fuller feed? Wow, great article! It is common sense but I honestly didn’t even think of it. I am on #5 and he wakes often in the night. He will be 12 months on the 30th. Right now it’s mostly his teething but now I realize why he was waking so often before. Very interesting. My baby has always been a super quick nurser, but she definitely stays on the longest during her night feeds when she nods off. Maybe tonight I will try keeping her up for the 20 minute time period and see if that helps. She’s 6 months old and still wakes at least 3 times a night to eat, and more just for comfort. In her defense though, she’s teething right now, so hopefully it’ll get a little better soon! And also, I don’t work right now so I haven’t really tried to get her to wake up less during the night. She’s my first and I’m kind of just soaking it all in. Our 4th baby wakes up more frequently and I’m severely sleep deprived! I believe he eats enough but he likes to wake up 3 times anyway. I’m praying for more sleep.